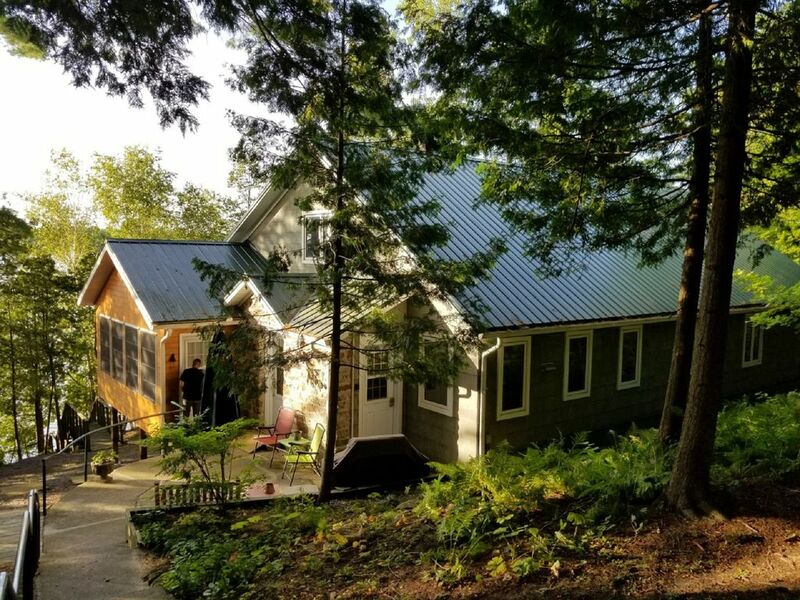 Exclusive All-season classic cottage right in the heart of Big Rideau Lake. The property has a main building with three bedrooms that sleep 6 total, with a pull out that can sleep 2 individuals. The main building has a spectacular view of the lake and sunset with large windows all around the cottage. Includes large all-wood sunroom with plenty of seating and breakfast table. Full and unrestricted access to the water via large dock, which can accommodate several types of boats and is great for swimming in deep water, no rocks or weeds at the end of the dock. The property is cooled by air-conditioning and heated by wood and/or propane. Abundance of fire wood is available on sight . Includes two full washrooms, Sauna, Mini-bar. It has a spacious kitchen with two sinks and a large stand alone freezer and large fridge. All Kitchen supplies included. All beds are ready with clean bed sheets and linens. Towels and bathing supplies are included. Cottage has a laundry washer and dryer for those extra long stays, detergent is supplied. Cottage has two out door fire places, one at the front facing the lake, and another at the back for larger groups. Cottage is sheltered on all sides for privacy with trees and shrubs, wooden fence around 70% of the property. Great lake for fishing in wide open waters. Backyard is large for big festivals and BBQ. Inside is a large living room space to accommodate everyone with fireplace and flat screen using chrome cast, Wii-U, Blu-ray & Wi-fi included. There is a public boat Marina in Portland. Canoe available. Must bring your own fitted life vests. We had a family winter get together in March and it was the perfect spot. The cottage was very roomy with lots of windows for the most beautiful view of the lake. The beds were sooo comfortable. We enjoyed ice skating with a friendly game of hockey. Also went tobogganing followed by an outside wiener roast. Also lots of deer tracks close to cottage but unfortunately missed seeing them. Inside the kids enjoyed the wii games and the youtube channel and watching the birds at the window feeder. I would highly recommend this cottage. Lots to do in a winter I can only image what summer would have to offer!!!!. Lots of memorable Family memories made. Stayed here for 3 nights with some friends visiting from New York City over New Years. Our experience was amazing! Right from the beginning of the booking, Hany was easy to reach and answered all of our questions. We arrived to a beautiful, very clean, already heated cottage with clean sheets and linens on the beds already. There was plenty of space, more space than the 6 of us knew what to do with. We always had something to do: BBQing, smores on the bonfire with plenty of stocked wood, videogames on the Wii, Netflix on Chromecast, the SAUNA was so relaxing, and we even skated on the lake! Overall a great weekend away with friends, highly recommend!! I also recommend reading the emails carefully, we had downloaded the app thinking it would be more convenient but all the information is detailed in the emails, no need for the app! Overall a great experience, we can't wait to book again! I would definitely recommend this place to other families. We were there for a Christmas family gathering and the place had everything we needed: fully loaded kitchen with two fridges, lots of light, washer and dryer, separate tub to wash the kids, large dining room for big family meals and three good sized bedrooms. To list the cons on this property would be to make sure you talk to the owner about garbage management and cleaning before booking. There are particular rules in the community that need to be observed and it would have been nice to know them before. Nevertheless, the cottage is a great value and the setting is perfect if you want to escape into the nature! Stayed with my family for 5 nights, and enjoyed every second. The property is perfect match of rustic cottage, yet nicely appointed to have all the comforts of home. Caught a few bass, pike, and loads of panfish right from the dock. Were very lucky with the weather and swam from that same dock. Incredibly quiet, you've got no idea that you've got neighbors. The pictures don't do the outside space justice. The owners are very accommodating and are clearly working to upgrade the inside and out. Will be back! Sewage backed up from the septic clean-out pipe in the basement utility room about half way through our stay. This had the effect of making the downstairs bathroom unusable (and of course the smell downstairs not very pleasant). Called Hany, and although he mentioned that someone would be there to take care of it right away, the maintenance person that came mentioned that this had been an problem before, and it would have to be taken care of, but by the time we left, the issue was still unresolved. As a landlord myself, raw sewage leaking into the basement of a rental property is pretty big deal, and warrants an emergency call to "Roto Rooter". I'd recommend using them (or the Canadian equivalent). We regret to hear this feedback and we apologies for this inconvenience in your stay with us. This is the first time this issue as occurred and we are working delifently to make sure the issue doesn't reoccur. Part of the problem was the diagnosis of this issue. What first wast a usual toilet clog, became a main drain clog during your stay. We got to work as soon as the issue occurred and its one of those things that we could not control. We now have resorted to using a peroxide cleaner as the snake was not effective in removing residual residue. Again we apologies that this had to happen during your stay.